Unsecured Financing, loans or funding are very common these days. They are issued and supported solely according to your creditworthiness as a borrower and no collateral is needed. Your credit score most often determines approval and terms of such unsecured financing. Credit Cards, student loans, and personal financing are some examples of unsecured financing tools that will help you achieve your personal or business goal. Usually unsecured loans are considered a bigger risk for lenders which is why they can have higher interest rates and require higher credit scores. If you need fast funding you may want to look for a personal funding program that will approve you for unsecured financing. FastUnsecured.com is always a great option as there are no upfront costs and you only have to meet minimum credit requirements. A personal funding program is designed to get you approved for unsecured funding such as unsecured credit cards as well as managing all credit card applications for you. You’ll start by giving your updated and supporting documentation. You’ll be asked for your phone bill, utility bill, bank statement, and other documents to get approved for unsecured funding in as few as 3 weeks upon receipt of all the information. Having at least 3 to 5 years of clean credit history is ideal, in addition to no derogatory items in your recent past. You can add more positive history to your credit score by using Seasoned Tradelines to more easily meet requirements. At least 3 revolving accounts are another requirement for unsecured funding if you are planning to get fast funding with FastUnsecured.com. Be careful with your revolving debt ratio, however, because you need to maintain a 30% or lower debt ratio. For fast funding you will need more than 700 points on your credit score. If you don’t, you can try adding Seasoned Tradelines in order to increase the overall quality of your credit history in less time. Using the services offered by FastUnsecured.com can help your credit score jump up 50 to 150 points in weeks. You should avoid credit inquiries if possible. If you have too many credit inquiries consider using a service like InquiryBusters.com to help remove inquiries from your credit report, but try to have no more than 6 inquiries per credit bureau in the last 6 months. Don’t be sad if you don’t meet some of the requirements because you can hire companies to help remove negative items from your credit report, acquire seasoned tradelines to improve your credit history, and delete inquiries within 1 to 3 weeks. Your business might also need unsecured funding. There are thousands of small businesses opening every day. Each one carries its own specific advantages and disadvantages but they all have one thing in common: needing capital. Sometimes going to a credit union or a traditional bank isn’t the best or easiest option for small businesses to access new working capital, which is one reason why unsecured financing is an attractive alternative for small businesses to obtain capital. 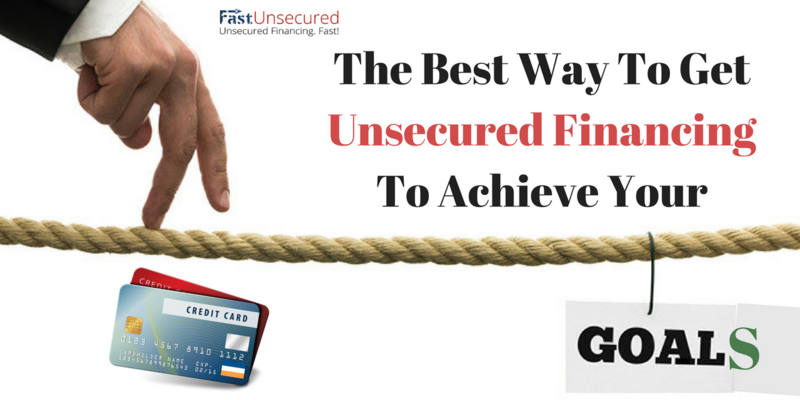 You can get fast funding with unsecured credit cards using CorporateCashCredit.com solutions and you will get funded at local banks in your area by using FastUnsecured.com. What makes unsecured loans an ideal option for unsecured financing is that you can get approved without collateral. You qualify based on the status of your credit history and your income. You don’t have to give up any of your assets in case you miss payments, but you better make your payments on time. Signature loans are another word for unsecured loans, because you sign an agreement and promise to repay the terms of the loan. TIP#1. Making payments on time is a must. Lenders will always check your credit history to see if you have successfully paid off your debts in the past. Most of theirdecisions are made based on the information given by your credit report, which contains your credit score. TIP#2. Creditors also check on your income because they want to make sure you have money to repay what you borrow after you get unsecured financing. Bank statements, tax returns, and pay stubs are some of the information that lenders may ask for to prove your income, evaluate how to work with you, and calculate your debt-to-income ratio. With Fast.Unsecured.com you have several options to choose from for the UNSECURED FINANCING you need for your personal goals, business, or any other reason. You simply have to check the requirements and apply to get fast funding. They will also help you with all you may need to get a great credit status by using services such as Seasoned Tradelines, credit-ready corps, cleaning your credit with Deletion Expert or deleting inquiries. All of these teams guarantee the best results to get the unsecured funding you need to achieve your goals. This article was written by GrandTetonProfessionals.com for FastUnsecured.com For Sales and Support Please Contact us at 203-518-8071 or, email us at: Support@FastUnsecured.com.For Media Relations Please Contact Misty.Burrell@GrandTetonProfessionals.com. Keywords: Fast Funding , Unsecured Funding, Unsecured Loans, Unsecured Financing.